While the news regarding Ayesha Gulalai’s allegations on Imran Khan shows no signs of dying down, there seems to be another twist in the tale. 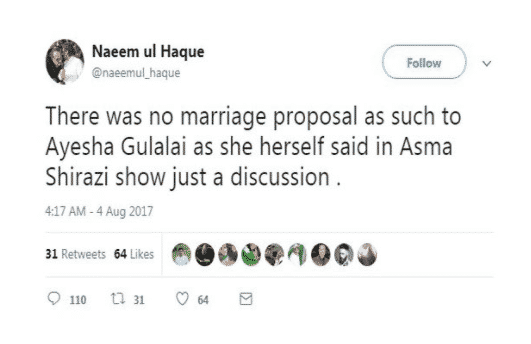 In an interview, Gulalai had also accused PTI’s spokesperson, Naeem ul Haque of sending her inappropriate messages. “Naeem ul Haque also sent a text after sometime stating, ‘I am alone and want to marry’”. This was yet another shocking revelation after a string of scathing allegations surfaced on PTI Chairman, Imran Khan. Late last night, the news regarding messages was confirmed by the official Twitter account of Naeem ul Haque. However these tweets were later deleted and later on turned down by Shafqat Mahmood, PTI Central Secretary Information, saying that the twitter account was hacked. The tweets posted from PTI’s spokesperson’s Twitter account stated that he had discussed the marriage with the ex-PTI leader and that there’s nothing wrong with it. An interesting thing is that the tweets were posted late at night, the first one at 3:10 am, the second at 4:17 am on 4th August 2017. “Just spoke to Naeem ul Haq. He told me his Twitter account has been hacked and false tweets regarding Ayesha Gulalai posted in his name”. It is hard to say who’s right and who’s wrong, however, time is the best judge. Let’s see how things unfold in the coming days. putting everything aside, i’m 100% sure that his acc wasn’t hacked. Even kids have stopped giving such excuses when they get caught and so, you should too. Growup! Yes ofcourse! it makes sense to put such a comment on social media knowing how much negative heat it would attract towards PTI….. I am being sarcastic if you havent figured this out yet. May I also ask how are you 100% sure, were you sitting with him while he was tweeting?! People without facts are just with opinions and thats all what you are. All things aside what is inappropriate in saying “I am alone and want to marry” unless he harassed her. And did she say “No” or anything in reply then It would more like a refusal than anything else. But still forensic team should be hired to end this case. BTW Ayesha’s father sold her respect and political career . pti “the gali galoch party” nhi manay gi. uskay supporters apni taraf say sfayan pesh kar rahy hain. Jin per ilzaam hay un ko sfai dainay dia karain plz. I had some sympathy with PTI with expectation that they set good standards in politics, but they disappointed the most. On the back of others who don’t want to see nawaz as PM this party took pakistan’s politics back to the 90s when Nawaz and BB used to do leg pulling of each others. They learned this after a decade and started mature politics to strengthen democracy but this erogent guy still has to go through same cycle of learning curve. The loss for Pakistan only. WHOLE BUNCH OF WIDOWED *Tsunami Phateechar Rallakuta Shaadi Umeedwaars* PROPOSING ONE AFTER THE OTHER…!! !